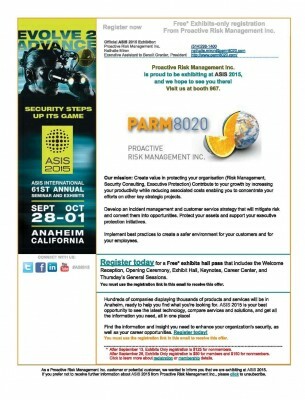 Proactive Risk Management will be at the ASIS 2105. Proactive Risk Management Inc. (PARM) is a leading multinational provider of risk management and security services. By taking a global and integrated approach to risk management and by recruiting the security industry’s top talent, PARM has been able to provide an unmatched level of service based on four interconnected pillars: business intelligence, incident management, loss prevention & security services, and technology / tradecraft innovations. Our 80-20 mindset, inspired by the Pareto principle, ensures that our actions are targeted and efficient, identifying and engaging the 20% of risks that cause 80% of damages, all the while protecting the most critical nodes of our clients’ organizations. Elaborate a risk mitigation and loss prevention strategy tailor-made to our clients’ needs – Provide counsel, implement innovative initiatives, and create value for our clients’ organizations. Provide the highest level of service to our clients through a transversal integration of the security function.